The newspaper Al-Wafd has published an article accusing Zahi Hawass of smuggling ancient antiquities abroad on behalf of the family of former Egyptian president Hosni Mubarak. Hawass says the claims are foundationless and has asked the country’s Procurator-General to investigate. The source of the allegations is disgruntled SCA employee archaeologist Nour Abdel Samad. His reliability as a source is however questionable. Since he was employed in 1987, he has apparently written frequent complaints and filed various lawsuits against colleagues and others. According to Al-Ahram has also faced a number of disciplinary actions in recent years. One of the affairs he has been associated with was the disappearance of a gold earring from an excavation carried out with the Polish Mission at the Marina archaeological site. He claimed the object went missing while under his charge when rats ate their way through a wooden storage box in which the object had been kept, he was brought before a disciplinary court in 2004. The matter of responsibility for the rats’ actions has yet to be resolved. 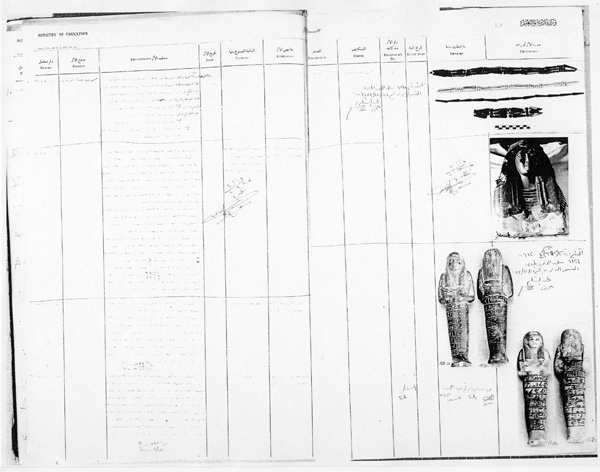 It is interesting to speculate what kind of antiquities the Mubarak family are accused by Samad of smuggling. Would they be a few top-dollar pieces destined for the prestigious auction houses, or would they be bulk shipments of more ‘minor’ artifacts such as shabtis and scarabs easier to slip onto a no-questions-asked market? I bet Samad has just about as much possibility of demonstrating the existence of such transactions from ‘the bottom up’ in the source country as we would have in the market countries searching (‘from the top down’) for the origins of material coming freshly onto the market. The utter lack of transparency of the antiquities market would hinder such attempts. It is very difficult for collectors to avoid buying potentially stolen artifacts in such conditions. Which is why I guess so few even try with any conviction. My Mum when she heard the news I was going after all to Egypt said that I was "not to talk to any Arabs"... (ummmm....) I have been to Tahrir, got pulled into a demonstrating group, been chatting with all sorts of folk. I came to the conclusion that the TV gave us a distorted view. I made a series of slides of Archaeological Traces of Revolution. Best of all I spent the whole day wandering round the Egyptian Museum trying to correlate what we have been told with the traces left. It was quite an eye opener, more here later. Quite by chance after I had almost given up trying to corelate the Al Jazeera photos with what I saw, I was able to tag onto a conducted tour of the looting trail by a member of the Museum direction, who seemed to get the impression that I was not believing everything he was telling us and he abruptly called off the tour after we saw the Akhenaton figure. Then even more exciting for me, again by chance I bumped into Salima Ikram who then walked round with me pointing out things I had not thought of. Wonderful, I have always wanted to meet her. There is more I want to say, I understand a lot more now I have seen it with my own eyes, and now have a much clearer idea what probably went on (and its not what we've been told) but the computer from which I am writing this in Cairo is not in the best of moods today, so will update from hand written notes when I get to Luxor. 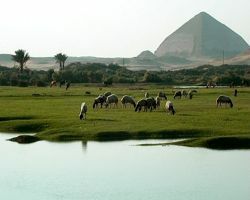 This blog is apparently being read in Egypt too, among those looking in (hi guys) there's a computer in Cairo that has been following my attempts to make some sort of sense of the conflicting information trickling out very assiduously. So I hope they see this and pass on the suggestion to the decision-makers. Please. The Egyptian Museum in Cairo normally has a strict no-photography policy. Would it not be useful if for a week (or two- depending on visitor frequency) after the re-opening this was suspended? This would allow visitors to the museum to take photos of the objects that were missing and are now back in their cases, to document the superb restoration efforts, and any damage that - despite all these efforts - is still visible. These photos would be an important historical record, but also set a lot of minds to rest and show the museum has returned to near-normal after these shocking events. I additionally have an ulterior motive of course, preliminary reports suggest the Museum might be open again as early as Sunday (hooray!). My plane lands in Cairo on Sunday morning and I have a connection to Luxor only Tuesday (bought because I was originally booked in on a later flight which was cancelled) so - whether the Museum is open or not - guess where I'll be headed for on Sunday afternoon or Monday? Kate Phizackerley has a post on her blog with links to some of the videos that resulted in Hawass' showing the international press on Wednesday that the Cairo Egyptian Museum is returning to normal after the events of two weeks ago ('Videos from Inside the Egyptian Museum'). She has found a Novosti one which is a bit unremarkable. The BBC one on the other hand is quite interesting especially because of the shot at 0:54 to which Ms Phizackerly draws attention. This is apparently Al Jazeera footage (or stills taken at the same time) and this part of the frame was covered by the breaking news bar at the bottom of the screen in all the Al Jazeera videos I saw at the time. 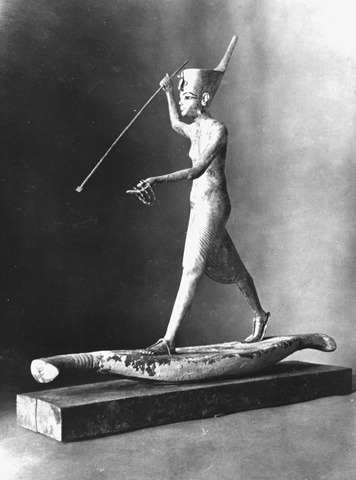 Its the upper part of the 'Tutankhamun standing on a panther' figure, and its position in the case might be the origin of the story that these were used to smash the glass. The BBC commentrary criticises the museum for its obvious lack of climate control and modern security and asks where all the money raised from access charges has gone. Others are going to be asking that question in the weeks to come. Ms Phizackerly also found a wonderful French video. This has two especially interesting bits. Inserted right in the middle are two attractive female conspiracy theorists who obviously do not believe the official story. The first asks who in their right mind would be going out with all those ropes. Something that still puzzles me, doubts not really dispersed by the suggestion that these are ripped-out electrical or Internet cables. The second lady makes a point which sort-of got lost in recent discussions. She observes that the two doors, inner and outer have not been forced, and asks whether some of the people going in had somehow obtained the keys. As Ms Phizackerly reminds us early reports suggested that the museum keys had been "stolen". The Museum Director at 1;34 says "this was the first showcase broken" while standing by the (now reconstructed) Middle Kingdom ship model and soldier figures. Well, that's not what we'd been told before. Confusingly the shots shown at this time also show the (now repaired) Yuya mummy bands, which are housed in a different part of the Museum. On a second look however, you can see that this is a voice-over, and when the film cuts for a second when he's actually speaking these words, the cases in the background appear to be the same as in the CNN video made a few days ago when we are shown the site of the break-in. Anon. 'Nefer-Neferland: A cultural history war comes to a head in St. Louis. Share', St. Louis Post-Dispatch, February 17, 2011. ..."the St. Louis Art Museum has taken a heartwarming stand for sanity and rationality". "...The museum's vibrant and intrepid director, Brent Benjamin, has within the parlance of refined society told [the Egyptians and their sympathisers] in no uncertain terms where to shove their ambitions....". The ACCG reckons that countries should enforce their antiquity protection laws, except if the object in dispute has found its way into a US collection, obviously. It was announced late on Wednesday that the missing limestone statue of Akhenaten holding an offering table stolen from the Egyptian Museum, has been found among garbage collected at Tahrir Square. It was found by a boy whose uncle was a professor at the University of Cairo. This now means, as I feared yesterday that all the rubbish collected from Tahrir Square is now going to have to be searched to find out whether any more of the objects were cast there and collected up as the square was hurriedly cleared. The fact that such a valuable object was thrown away is suggesting even more strongly that the Museum break-in had not been the work of knowledgeable professionals, as it originally appeared, but trouble makers and vandals. No mention was made of the condition of the object when found. 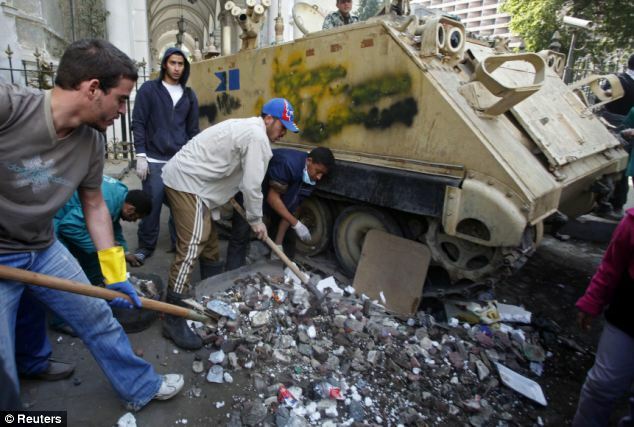 If the search for these objects now must be carried out throughout the streets all around Tahrir Square, it is even more imperative that photographs of all the items missing are made public immediately. Now the entire populace of this part of Cairo has to know what the objects everyone is searching for actually look like. 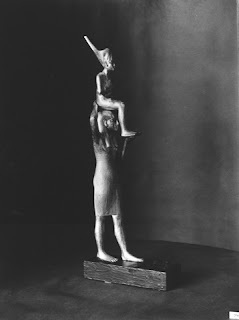 Kate Taylor, 'Stolen Egyptian Statute Is Found in Garbage', New York Times Feb 17, 2011. 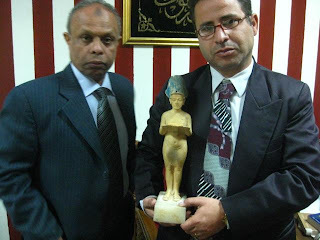 Kate Taylor, 'Egypt’s Antiquities Minister Says Valuable Statue Found', New York Times Feb 17, 2011. "If I'd have said the Museum was unsafe, I'd have been unpatriotic"
Here is a revealing interview/harangue from Zahi Hawass (from Al-Masry Al-Youm), there is an interesting comment at two minutes in, that it would have been "unpatriotic" to have said the Museum was not safe, it would show the country up in the eyes of the international community. Not telling things as they are I would say is rather more likely to do that. The President of the US dugup numismatic artefact lobbbying group the ACCG has changed, it was Bill Puetz, owner of the lucrative V-Coins coin sales portal (current value of ancient items on sale today $22,768,493 - twenty two million dollars). He has now been replaced by Kerry Wetterstrom, whose collecting activities have concentrated on dugup coins of Roman Egypt. Ongoing developments in the Egyptian revolution and its reverberations in the Middle East have the world riveted on this historical (sic) event. Beneath the headlines, vacillating reports of vandalism and looting that allegedly took place at the Egyptian Museum in Cairo and other sites have American collectors deeply concerned about the possibility that looted material may soon be appearing on the international markets, and joins the American archaeological community in calling for greater vigilance of imports of ancient artefacts deriving from Egyptian sources in order to protect collectors frequenting the legitimate antiquities market from the risk of acquiring stolen and looted items. Or at least that's what they should have said. What they actually said is a different matter. They are not at all concerned about protecting collectors and the legitimate market, but their ability to sell whatever they like in America no-questions-asked. Shame on you, shame on the lot of you. Photo: ACCG President Kerry Wetterstrom , collector of dugup Roman coins deriving from Egyptian mints, from the ACCG website. The President of the US dugup numismatic artefact lobbbying group the ACCG, coin collector Kerry Wetterstrom has joined the debate on looting and the antiquities trade . The somewhat muddled PRNewswire text "American Collectors Eye Events in Egypt with Mistrust", highlights his views on the matter. Let's take a look at them. According to Kerry K. Wetterstrom, President of the Ancient Coin Collectors Guild (ACCG), the reason for concern among collectors is that import restrictions like those sought by archaeologists have typically been applied far and beyond the scope of authority vested under U.S. law. [...] This tendency toward bureaucratic overreach is discussed introspectively in Archaeology Under Dictatorship, Michael L. Galaty and Charles Watkinson, eds., New York, 2004. In the final chapter: Dealing with the Devil: The Faustian Bargain of Archaeology Under Dictatorship Bettina Arnold says: "Financial dependence on the state makes archaeology especially vulnerable to manipulation by political entities, including individual leaders, whose interest in its research potential varies but is always expedient." So who, according to Mr Wetterstrom, is "manipulating archaeology" in the US? Surely until now the ACCG mantra has been that it is archaeologists manipulating the State Department (?) So US archaeologists are manipulating the US government who is in turn manipulating US archaeologists through entrapping them in financial dependence? (Really?) What a mess, but I rather think it's in the logic of Wetterstrom's thinking than the politics of archaeology in his country. The new guy Mr Wetterstrom really ought also to sort out what it is the CCPIA regulates, it is not as he suggests "provenance" but documentation of legal export from the "source country" (!). Anyway, passing on from that tangled tale, let's have a look at the next. Coin collectors see the driving force behind import restrictions as stemming from a belief that legitimate markets for cultural objects fuel clandestine excavation or theft in source countries. To collectors, the failure of states to enforce their own cultural heritage laws is a key factor in any illicit activity. Corruption within nationalist governments is pervasive and compounds the problem [...] the best approach to reduce looting and corruption is to address the problem at the source. Well, postulating that this is the only way forward and dealers and collectors have no responsibilities whatsoever (indeed victims of the situation) may be very comfortable, but is it true? Yesterday I posted a text about measures in England to prevent ongoing archaeological looting there. I am not sure where corruption comes in there, does he think the British police force is corrupt because they are not catching the night-time looters? Or perhaps British politicians or heritage organizations? This really needs clarification. (He may argue that a body called English Heritage is in some way "not nationalist", but could he argue it with any real conviction?) Then we have the US Four Corners case, Wetterstrom seems to be suggesting that the solution to the endemic vandalism of archaeological sites there is a clampdown on the artefact diggers. Is that the ACCG position? I thought they were campaigners for "collectors' rights"? But obviously we cant have one solution for the US and one for the rest of the world (imposed by the US), can we? The ACCG has always been quick to present US collectors' "recommendations" for the rest of the world to follow (the "Witschonke Argument"). They have with equal alacrity shied away from the implications of applying the same measures to resolving the same problems at home in the US. Why? Maybe now the ACCG has a new leadership, we will see the reverse approach adopted more consistently. But surely, short of policemen lurking behind every bush or rock all night every night by every lootable archaeological site across the western hemisphere (and Africa, the Near East and Far East too) at tax-payers' expense, part of the operation to enforce the antiquities legislation is keeping a close eye on what is happening on the antiquities market (it will be recalled that this was one of the recommendations of the Oxford Nighthawking Report on which this new English heritage scheme is based). It seems to me that Wetterstrom is standing by the traditional collectors' position that the looting of archaeological sites somehow has no connection with the no-questions-asked antiquities market and that sorting it out is the task and problem of everybody else, and not the no-questions-asked dealers and collectors. They consider themselves marginal to the solution. I think it is obvious to the rest of us that they are central to it. 55% of British Archaeologists Think Metal Detecting Should be Banned? A wee while ago I discussed what seems to me to be a slanted poll on a forum run by pro-collecting Scottish archaeologist David Connolly. The results however turned out to be rather interesting. Although Connolly's percentages don't add up, calculating them properly suggests that of those polled, 55% of respondents thought metal detecting should be banned. If this is a real index of the trend of opinion, that actually comes as a surprise to me, and I do hope the Portable Antiquities Scheme ("Britain's largest archaeological outreach") saw it too. Their policy of ignoring questions and issues raised from an archaeological viewpoint may be losing them support among archaeologists - which is as it should be. By isolating themselves from ongoing and developing discussion, they cannot hope to remain mainstream and perhaps are doing more to marginalise themselves than they realise. There is somewhat belated official concern that Scotland's archaeological heritage is being plundered by treasure hunters who fail to declare their finds in the national interest. In Scotland, any finds classed as treasure, including items such as axe heads and stone carvings as well as gold and jewels, must be declared to the Crown, which will pass them on to museums or other suitable collections for public display and study. Before any smartass but uninformed US coiney suggests it, Scotland awards finders full market value for finds added to the national collections like their English counterpart. Professor Ian Ralston, chairman of the Scottish Archaeological Finds Allocation Panel, said: “If you look at the amount of stuff found in Northumberland and Cumbria compared to the south of Scotland, there has to be a suspicion that there is a significant number of undeclared finds”. The problem is brought to light in the Scottish Treasure Trove annual report, published yesterday by the Queen’s and Lord Treasurer’s Remembrancer. 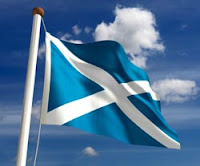 The report points out that the difference between the English and Scottish system is that objects found by artefact hunters and collectors north of a line on a map are liable to be added to public collections in the public interest, while south of the line collectors can add the stuff to their own private collections. All the arguments about "metal detectorists" contributing to the common good by recovering items are shown to be nonsense by this situation, what it is about is not "saving the 'eritidge" but about making a personal collection. As Watt points out "with treasures (sic) remaining in the hands of finders, the scheme south of the Border is seen by some critics as selfish". Indeed it is, no doubt about it - but its not the only area of antiquity collecting and trading that places selfish self-interest above all other considerations, such as decency, honesty and respect of the law. There are around 100 members of Scotland’s two metal detecting clubs, according to Alastair Hacket, secretary of the Edinburgh-based Scottish Detector Club, with at least 100 more who pursue the hobby independently. Numbers have risen in recent years thanks to high profile successes like that of David Booth, the novice from Stirling who found £1 million-worth of gold in 2009 on his first outing with his new metal detector. The safari park worker received a £462,000 reward. Just 200 in the whole country? Or is the number closer to 2000? Most discoveries in Scotland involve small artefacts like coins, but the Treasure Trove report warns that expertise in this area is now lacking due to the retirement of the country’s leading numismatist. The National Museums of Scotland has not replaced its coin expert, the report said, meaning that officials face the prospect of bringing a coin-dealer up from London to handle Scots finds. Surely if there are no local numismatists capable of doing the job, it's probably easier to send batches down south. Does it have to be a dealer though? Why not knowledgeable collector (we are always being told by the coineys that there are such). Anyway in the majority of cases, can't this be done online these days? So the ACCG could help out too. I suppose now we'll be hearing the coineys alleging that if the state gathers such finds for the public collections, this hinders the growth of coin collecting in Scotland, which deprives the nation of such expertise. I wonder though how many Scottish collectors are patrons of eBay and V-Coins regardless of what happens to local finds that are reported. And where do the finds that are not reported go? According to the coiney arguments, if the state takes them off finders reporting them, the rest must be melted down to create "tourist trinkets", eh? Vignette: map for US collectors of dugup ancient coins who have difficulty in distinguishing "England" from "Britain". Scotland is the orangy bit at the top. a "months long" investigation of the mask's origins and found no evidence that it was stolen - it claims that even Egyptian law is on its side. "The museum conducted a thorough investigation of the mask's provenance before purchasing the mask," the complaint states. "The museum's investigation revealed no evidence that the mask was owned by Egypt under applicable Egyptian law at the time of excavation, that the mask was stolen from Egypt, or that the mask had unlawfully entered the United States. Well, of course the text does not say that the Museum ascertained it had legally left Egypt, which should be the starting point of any investigation. What evidence did they seek? DID they find out about the mask's "origins" before they bought it? My reading of the story indicates that they did not discover that it had been excavated in 1952 at Saqqara and published. A thorough investigation of the "provenance" (ie collecting history) would not leave the glaring gaps and inconsistencies uncovered by a pair of journalists working for the local paper who probably did not have to take "many months" to write their story. "The United States government cannot show probable cause the mask was 'stolen, smuggled, or clandestinely imported or introduced' into the United States. But then neither (I bet) can they show that it was not smuggled out of Egypt. Whether or not it was "clandestinely" imported or introduced into the USA is neither here nor there unless you are a cultural property lawyer arguing on behalf of a client. Even if the mask was stolen, the museum says, the Tariff Act of 1930's 5-year statute of limitations has expired. "As early as December 31, 2005 ... the United States government had actual or constructive knowledge the mask was allegedly stolen. ... As such, the United States government possessed, more than five years ago, either constructive or actual knowledge sufficient to discover the alleged theft of the Mask from Egypt," the complaint states. "Pursuant to 19 U.S.C. § 1621, the United States government is time-barred from proceeding against the Museum under the Tariff Act." Whether or not US culture-thievery laws are on the side of the museum, what does this say about the people of St Louis, their Museum and its trustees? Will they be acquiring much more dugup stuff from Egypt as it comes onto the international market after doing similarly "thorough" investigations of its origins? Is it for the US government to investigate the doings of the local museum, or is this something the good people (the good ones) of St Louis should be demanding the Museum does for itself? St Louis, the Lootier City? Whatever the museum claims to have "done" in 1998, there are awkward questions about the collecting history of this object, what has St Louis done to break through the fog, instead of waiting passively to see if anyone outside can "discover the alleged theft" and then when the statutory five years are up thumbing their nose at everyone? Previous coverage here, here, here ("it would be interesting to hear Mr Goldstein's side of the story" - never did), here, (talks about the "won't get this from me until you prize it from my cold dead hands" attitude this court case illustrates - but also draws attention to Laura Elizabeth Young's online 2007 MSc Thesis which "provides a few additional details about what documentation SLAM posessed at the time of purchase and what joined the files after" do have a look at that and see why that is so significant to the case put forward by SLAM) . Also here. But the story has its real beginnings in the February 2006 Riverfront Times article "Out of Egypt: From a long-buried pyramid to the Saint Louis Art Museum: The mysterious voyage of the Ka-Nefer-Nefer mask"
UPDATE: Two hours later, I see somebody on a computer I identified earlier as probably in SLAM has spent quite a bit of time looking through this post and the links. Good. Give it back!! Ton Cremers has written a rather more sharply-worded post on MSN ("THIS MASK WAS STOLEN IN EGYPT AND THE SAINT LOUIS ART MUSEUM KNOWS") which puts it in a nutshell. This is a matter of collecting ethics and not US law. It was Tom Cremers, then the operator of the Museum Security Network, in Amsterdam, who alerted the world to this case, sending according to SLAM "multiple e-mails to government officials in 2005 and 2006 calling for an investigation". The fact that the gubn'mint did not do any such thing is what this legal case celebrates. The US government scandalously has no bilateral cultural property agreement with its big ally in the Middle East, Egypt. This is because under the Mubarak government Article 9 of the 1970 UNESCO Convention the only one that the CCPIA (US sham "implementation" of the Convention) recognises) was not felt applicable. UPDATE: And the collectors' view? "The Grand SLAM". Vignette: Egyptian documentation (you know, the ones SLAM - stalling maybe to wait out their five years - said if the Egyptians produced it they'd give the object back?) from the Stanford summary of the case. The museum staff is not yet able to move freely within the museum, and has, until now, had to walk in groups of 10-15 people, accompanied by soldiers. Unfortunately, this has slowed down the search, and made it very difficult to carry out a final inventory. The army is allowing very few people into the museum, and the first time the museum’s office staff was allowed in was on 6 February 2011. The list announced in the press release of 12 February, 2011 is preliminary, and will continue to be updated as new information comes to light. As Dr. Hawass has previously stated, until a full and thorough search of the museum and its grounds has been completed and all of the damaged vitrines inventoried, a list of missing objects cannot be finalized. Last night I heard that the decision has been taken that the 2011 season of the Polish-Egyptian mission in Deir El-Bahari will be continuing (it had been functioning with a skeleton staff throughout the recent events but it was unclear whether it would continue or cut sort the season). Our (Polish) Foreign Office has not yet downgraded its travel warning, but diplomatic sources suggest its a matter of days. The British one has however downgraded theirs. So after talking with Cairo last night, I will close the half-packed suitcase gaping all this time in the hall attracting dust and cats and fly out Sunday at dawn for a shortened stay. So blogging really will be light from the end of this week. The shorter stay means I will not be able to get done all of what I had planned. Last night however I saw the preliminary results of ground penetrating radar survey of where I am supposed to be digging in the Lower Court (a small version here), and they are amazing but at the same time worrying. It seems that against all expectations (as turned out to be the case last year) the earlier work there had not removed all of the stratigraphy. So what should have been a 'take-off-the-old-backfill-down-to-rock' exercise to prepare foundations for the display of reconstructed statuary looks like it could be far more interesting - and complex. It seems though with tourist figures down, there may be no better time to excavate the bit we were planning. Let's see what conditions are like on the ground however and how far the paperwork got through the SCA before all the troubles. Meanwhile I have been enjoying Peter Kircham's blog, he's down there as a tourist, having a whale of a time just observing life as it goes on in the Luxor region. Worth a read. Photo: The Lower Court of the Hatshepsut temple (middle foreground on the left) from not-even-half way up the cliffs behind, the degree to which that valley was modified to fit this thing in is not often appreciated, modern excavators' spoil heaps don't help either. [the thing in the foreground right is the Mentuhotep temple] (Photo PMB 2009). 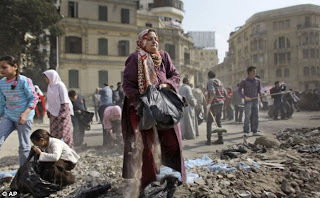 Cairo Museum: Looting and vandalism, or just Vandalism? The latest news from Cairo is an interview on CNN in which Zahi Hawass stated that part of the statue of Tutankhamun being carried by the goddess Menkaret has also now been found. 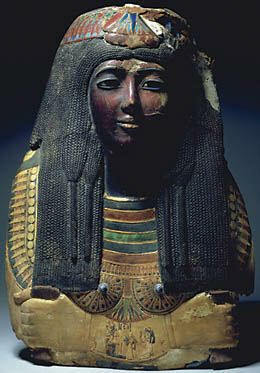 However, the figure of Tutankhamun from this object remains missing. Hawass' own blog carries the additional and worrying information that what has actually been found are "fragments" of the goddess. It turns out that the coffin fragment and scarab were in the museum ground on the west side, while the shabti was found in the museum stuffed under a showcase. I am beginning to get a bad (even worse) feeling about this latest development. (At least) sixteen objects are still missing, presumed stolen. What if that is not the case? What if the objects now (only now) being found scattered on the ground outside the museum are just part of the same senseless breakage and scattering of objects from the smashed cases inside the museum? In other words, the people who grabbed stuff out of the cases and threw it on the floor sometimes on the other side of the Museum, were also carrying stuff outside and threw it down there. Perhaps nothing was actually taken very far, just damaged and scattered. While from the point of view of looters, that seems a pretty illogical thing to do and takes up time that could be spent looking for something more worth nicking (unless as I pointed out earlier it was done to hinder actually working out what was missing), a scenario it would fit was the earlier suggestion that this was (in part perhaps) done by rent-a-mob thugs intended to discredit the protesters in western eyes. They might have had pretty unspecific orders like "go in there, smash a few cases, make a mess and avoid being caught". That they would seem to have done. They may have taken several items on their own initiative, but its beginning to look like this was an exercise in making a mess à la Baghdad for the news cameras. If so, how do we know that all of the bits taken outside were chucked away in the museum grounds and the museum? What was thrown down and where, and what has been taken? The Museum staff is working frantically to answer this question. It would be awful if it turned out that some had been dumped by escaping vandals among the mess in Tahrir Square and carted away with all the rubbish and fecalia when the square was cleaned last week before anyone knew to tell the street-cleaners to keep an eye open for misplaced musealia. I am beginning to suspect that the key to all this and the first wave of looting is the dismissal of the cabinet not long before. It looks rather like certain people, perhaps individuals immediately under - and thus protégés of - the people actually dismissed, fearing they face lose influence, deciding to try any measure which might help reverse the situation. It would be nice to see a full investigation of who gave the orders for the police and security forces to withdraw at the same time as prisoners were "escaping" in large numbers to further destabilise the situation. Dr Hawass ('Egypt Official Talks Museum Robbery' CBS News February 14, 2011 4:49 PM) has other problems on his mind today and seems to have problems counting (note empty bookshelves probably reflecting his move of office to a Ministry building). CBS News' Terry McCarthy speaks with Zahi Hawass, Egypt's Minister of Antiquities, who describes how thieves climbed in from the roof using ropes and let themselves into the Egyptian Museum during the recent protests there. So I see we are back up to "nine" looters again. They were "captured by the Egyptian people" (outside the Museum). These are presumably the nine (later altered to ten) who were reported by Minister Hawass "still in custody" the other day. But then were these not those "ca. ten" men (note coincidence of number) who were captured by the Army on the night of the looting who were arrested because they "tried relentlessly to scale the western museum surrounding wall" (so presumably did not get into the Museum - or were they trying to get out)? But oh dear: "then two days ago, we found out... that.. eight [shows five fingers] objects were missing. Actually they are small pieces..." [makes gesture how small]. Note also the gesture he makes for the goddess holding "king Tut". He also says it was the "head of a scribe" rather than the full figure. "We have to thank God that all the masterpieces are there [apart from the ones that are not - PMB] and these small items - eight of them [shows five fingers] - we found until now three". Ah, so that means there are now only five more to find? In actual fact they have found two from the list of eighteen, nice in itself, but not quite the same. At the end of the video, Hawass announces confidently "I have a plan" how to get the tourists back to Egypt. On Monday Zahi Hawass announced the recovery of at least two of 18 relics reported missing from the Egypt's main museum in Cairo after it was looted on 28th January. Searchers reportedly found the heart scarab of Yuya and one of the shabti statuettes from the same tomb that had been reported missing the day before, they were found on the ground outside of the museum's display areas (Al Ahram reports "on the east side of the Museum, near the gift shop"). It appeared the thieves threw the scarab outside the museum, Hawass said. 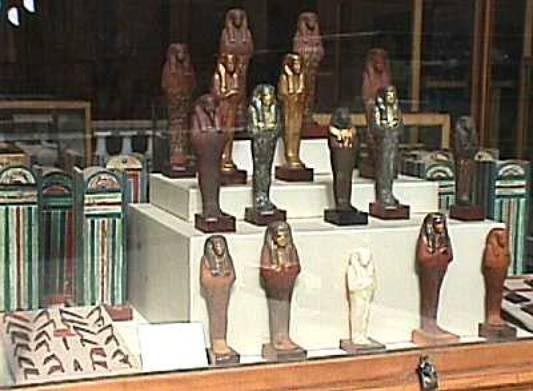 The other objects lost, including the other 10 Shabti statues stolen remain missing. Hawass expressed the hope that "at least some of the missing items may be buried (sic) on the museum's grounds". None of the western newspapers hastened to pick up the story that it was a symbolic heart which was found on Valentine's Day. Did the shabti and scarab drop out of an overfilled knapsack, or was this the sole loot of one member of a larger gang, one who'd been operating in the the Yuya and Tuya gallery? Very odd that nobody spotted them earlier, its not as if the museum has very extensive grounds, or particularly long grass, and earlier reports suggested that Museum staff had searched all around the Museum and up on its roof for the missing bits for two weeks before producing the list of what was actually missing. Also if any more have been lying out there for two weeks with the army tramping around and at least one night that was rainy, one wonders what sort of state the wooden artefacts would be in. Al Ahram: Looted artifacts from Egyptian museum found reports the recovery of a piece of the coffin damaged in the raid which was not on the list of the stolen objects. But what an odd 'object' to take, a chunk of wood is hardly comparable to the other items reported missing. This was reportedly dropped by the looter when outside the museum, but (if it turns out it was big enough), perhaps he'd taken it in order to smash showcase glass (or maybe use if to defend himself against any guard who might try to stop him). Curiouser and curiouser. Repeat the UK Mantra: "Night Hawkers Bad - Metal Detectorists Good"
Acting rather belatedly, English Heritage has launched a "campaign" to "combat criminals who steal from historic buildings and wreck archaeological dig sites". One focus of this initiative is to attempt to "clamp down" on "practices such as "nighthawking" where thieves use metal detectors to find buried historic objects". This campaign also highlights the damage done to the historic environment by other antisocial behaviour such as arson, graffiti and vehicle damage, and architectural thefts and unlawful alteration and demolition of listed buildings (Louise Gray (Environment Correspondent - that's a turnup for the books!) 'English Heritage launch campaign against 'night hawkers'', Daily Telegraph's 'Earth News' section, 11 Feb 2011). More than 200 [archaeological] sites were attacked between 1995 and 2008 by ‘night hawkers’, according to English Heritage. At the same time the number of metal detectors in the country has increased to around 20,000, according to the National Council of Metal Detecting. However the body insisted that the majority are law-abiding citizens that ask permission first. "...people can make money from small finds such as buckles and coins. But major treasures are extremely rare and impossible to sell on. People may certainly take up the hobby for that reason [high profile finds] but will soon discover there is as much chance of winning the lottery". Well, actually with some 800 cases reported a year in the UK, a bit of maths suggests that statistically if there are 10 000 people doing it regularly, you have only to keep at it twelve and a half years to have the chance of finding Treasure. Substantially better odds than doing the lottery, Mr Austin. Even if the number of metal detectorists is closer to the 20 000 mark now. English Heritage are teaming up with the police and the Crown Prosecution Service (CPS) as well as groups such as the National Trust, the Church of England and the Woodland Trust to try and tackle the problem. The initiative will focus on illegal metal detecting, [...] and unlawful excavation and removal of artefacts from sites. As part of the initiative local history societies and neighbourhood watch will be encouraged to look out for ‘night hawkers’. So no 24/7 site guards for all the lootable sites in the country as US collectors say is the "only" way which a nation whose heritage is threatened by looting should be looking after it. Just local citizens and the Church (!). So what are they going to do, excommunicate metal detectorists? Baroness Andrews, chairwoman of English Heritage, said society needs to work together to protect treasures. "Illegal metal detecting can cause damage apart from digging up fields. It can remove objects from their archaeological context so if, at a later stage, we did a proper excavation then there would just be holes and things. "Holes and things" however Mr Lane is what is left by legal metal detecting too. I wonder if Mr Lane can explain to his readers why from an archaeological point of view holes in the archaeological record any less of a hole when dug by an artefact hunter doing his exploitation in accord with Britain's pathetically inadequate archaeological heritage protection laws? I bet he can't. "The majority of metal detectorists carry out their hobby legitimately, voluntarily reporting their finds to the Portable Antiquities Scheme. These enthusiasts have a genuine interest in the past and their finds are helping to advance knowledge of our heritage. In Lincolnshire alone, legitimate metal detectorists have reported 28,000 finds during the past ten years. These have led to the discovery of 175 new sites ranging from Roman temples to medieval markets. Unfortunately, there are those whose actions are criminal – damaging our fine heritage – and Lincolnshire County Council supports any initiative to tackle this and any other sort of heritage crime". Bleh! If there are only 10 000 active metal detectorists in the UK, in Lincolnshire statistically there should be 119 of them. In 2007 Mr Daubney in fact recorded finds from 161 of them (perhaps some from out of county on commercial rallies), 110 of them metal detecting club members (but only 17 other members of the public) [source PAS 2007 Annual Report pp 274-5]. According to the Heritage Action Erosion Counter algorithm however, those 161 detectorists would have found in a year's artefact hunting 4871 recordable objects (so 48,710 in a decade) - whereas the number of findspot records resulting in the public record in 2007 was 1408 [PAS annual Report p. 268]. So even here (a county with relatively high reporting rate) two thirds of the "legitimate" artefact finds are not being reported in the last year for which official figures are published (the figure is in fact higher as the HA figures are deliberately conservative). Of course if the NCMD estimate of 20 000 detectorists in the country is correct, these figures are doubly bad. As for "discovering new sites", the same PAS report shows (p. 33 table 1, figures for Roman to Medieval sites) that the artefacts entered in the PAS record came from 165 new sites, but the exploitation for collectables of 139 sites already known in the HER. That is 45% of the data are coming from the destruction of known archaeological sites. How "legitimate" is that a use of the archaeological record ("our fine heritage")? Egypt's treasures are looted – "lucky all the best stuff is safely in Bloomsbury"
"Egypt's treasures are looted – lucky all the best stuff is safely in Bloomsbury" writes in the Telegraph a British "journalist and social commentator who specialises in politics, religion and low culture". The article is accompanied by a picture of the sawn-off and heavily wire-brushed Parthenon marbles "safe" in Bloomsbury, just an Egyptian Molotov-cocktail-throw away from the offices of the Portable Antiquities Scheme which can't quite seem to get to grips with stopping the British artefact hunters and collectors looting archaeological sites in their own country as a source of collectables. Most of those objects are not "safe in Bloomsbury", many are on eBay. "The Egyptian Museum releases images of artefacts looted during mass protests that ended President Hosni Mubarak's rule" says the blurb to an ITN news report. Sadly, these pictures are nothing of the sort. Egypt Looting: Are we Seeing the Beginning of Phase Two? News from Egypt suggests the country is entering a period of political uncertainty, confusion and inertia quite different I suspect from that envisaged by the enthusiasts both in Egypt and the outside world of the overnight dismantling of the existing regime. How long it will last, and what - in reality - will follow it is anyone's guess. This however is an archaeology blog, and on its pages an issue of importance is what this means for Egypt's sites and monuments and the illegal trade in antiquities. Two weeks ago it seems decisions were taken to withdraw civilian security from the streets and locations all over the country. The consequent breakdown in law and order over that weekend (28th - 30th Jan) led to the break-ins in the Cairo Egyptological Museum and museum storerooms over a large area of the country (apparently mainly in Lower Egypt in the region most affected by the unrest) and clandestine opportunistic digging on a number of sites and possibly also the removal of elements from some monuments. This was reportedly quelled by the stationing of army personnel on the sites affected (though they cannot have been stationed on every site in the country). The correlation between political chaos and this opportunistic looting was clear. Mubarak unexpectedly stepped down on Friday and a day after this Zahi Hawass announced that museum stores at Dashur had been broken into, reportedly on the previous night. On Sunday (unconfirmed) reports were posted by Kate Phizackerley on her blog which indicate clandestine digging at Abydos - according to this report "there are no SCA staff present on site": Looting of antiquities continues unopposed here in Abydos. Everyday I walk across the desert plain to my land beyond and every day I see evidence of illegal digging. The remains of mummies now litter the plain. 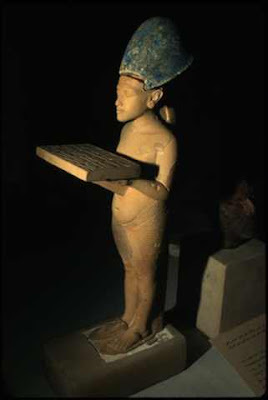 3/4 days ago 10 armed raiders entered the American mission house in Abydos and looted it. Police were frightened off by gun fire from the raiders. What the looters made off with is unknown and it is also unknown whether they gain access to the newly built restoration/storage rooms. I suspect that in the confused days to come, unless strong measures are taken to prevent this, both within Egypt and by the antiquities trade outside, given the value of these items on the market this is a phenomenon that can only spread. We saw this most infamously in the case of Iraq, but also all across eastern Europe with the collapse of the existing regimes - leading to the massive looting of sites on an industrial scale in regions like Bulgaria, Crimea and now the Early Medieval burial sites of the forests of Northern Russia. The only people to benefit from the survival of these sites into our times are the no-questions-asked collectors and dealers who fund those that despoil them to obtain saleable collectables. According to CNN, "On Sunday, thieves also attacked the Dashour storage area near Saqqara, Egypt, for the second time in two days after handcuffing guards at the site, according to Hawass. Antiquities officials were working to determine what, if anything was stolen, Hawass said". On the same day and presumably drawing on the same source, Al Ahram has a different version: "Minister of State for Antiquities Zahi Hawass announced that an inventory carried out at Darshour storage gallery, known as De-Morgans, by the site inspectors, reveals that there are eight missing amulets. A huge iron gate is to be erected around the gallery in an attempt to tighten security". I suspect the latter information refers to an earlier raid. Eight amulets seem just the sort of thing that one could easily hide somewhere and bring out to sell to tourists when they come back, let them worry about getting them out of the country. But where would poor downtrodden peasant farmers (who some antiquity collectors claim on forums and blogs are behind this looting) get handcuffs from? Perhaps his upbeat reports about other sites, including Saqqara, were [...] based upon incomplete, fragmentary reports. The fact that Hawass may have lacked full, reliable information during the past two chaotic weeks is completely understandable. But his misleading previous assertions about the Cairo museum break-in, where, in some instances, his own knowledge must have differed from his public pronouncements, is less excusable. Similarly problematic were his strong "factual" pronouncements regarding the "safety" of antiquities sites, about which he lacked complete and reliable information. If Hawass didn't know the full extent of the vandalism and looting, he should have acknowledged that, rather than giving blanket assurances that all was well. Those assurances, of utmost importance to Egyptologists, conflicted with some accounts from people in the field (such as archaeologists who work at Saqqara). As with the rest of Egypt's governance, we need more candor and transparency from its Ministry of Antiquities. Minimizing the problems undermines the credibility of the minister. But then of course the police and army do not know the full story either. What is needed is a full investigation, perhaps by an outside body, followed by a proper report, detailing exactly what went wrong and making formal recommendations on how to avoid this sort of situation in the future, both in Egypt and in the case of other museums. 4. STOLEN: "Statue of Nefertiti making offerings"
(the cultural property "internationalists" will delight in pointing out no doubt that the others are "safe" in New York - here's the Cairo ones) [UPDATE 14/2/11: one of these shabtis was found a day later lying outside the Museum]. 18. STOLEN: Heart Scarab of Yuya (oddly enough I cannot find a good photo of that online, I guess now it's been stolen, there's not much hope that there ever will be now). [UPDATE: Eloquent Peasant attempts to untangle the identity of this object, see her account here UPDATE 14/2/11: this scarab was found a day later lying outside the Museum]. Several people are suggesting this may not close the list of missing items. I fear their pessimism might turn out to be well-founded. An investigation has begun to search for the people who have taken these objects, and the police and army plan to follow up with the criminals already in custody. ("begun"?). How about also investigating why - according to Hawass - there were only three museum guards in the place, and how it is possible that, according to reports, the thieves had AN HOUR to do what they had come into the museum to do, when the sound of the smashing glass would have been echoing around the Museum loudly enough to hear above the noise of the mob outside. The head of the SCA and Minister of Antiquities had been gleefully telling the world how "ignorant" the thieves had been, even though it must have been obvious that the upper part of the harpooning figure was not among the pieces collected together for conservation more than a week ago, despite the fact that the Akhenaton statue was mentioned as "damaged" in an earlier communique. The varying conflicting messages given out concerning this break-in has given the people who have these priceless antiquities in their hands a full two weeks to get them out of the country, very probably facilitated by the general chaos at the main exit airports. It is clear that there needs to be a wider enquiry into the manner in which this crisis was managed and the precise circumstances surrounding this theft, arguably one of the biggest and most audacious art heists of all time. Who (that is a plural by the way) is responsible for the criminal lack of security in the museum that night and the subsequent concealment of the information about what was initially suspected as missing? Have a look at Dashur on Google Earth, the reason why this site was felt to be one of the safest in the pyramid fields is that there is a huge army base right next to it. We've been assured that the army has been protecting sites and magazines since the beginning of February. So why was it possible to break into this site last night? Some commentators have raised the question of when the break-in actually occurred and whether there are reasons why its looting is only now, the day after Mubarak 'abdicated', this news becomes public. Is the underlying message that the army is unable to look after these sites by itself? The conservation group Heritage Action has sent an open letter to the UK's Archaeology Forum,* concerning 'artefact hunting using “deep” metal detectors'. They suggest that the growing popularity of new metal detectors with greatly increased “depth” capabilities represents a new and significant danger to the buried archaeological resource. 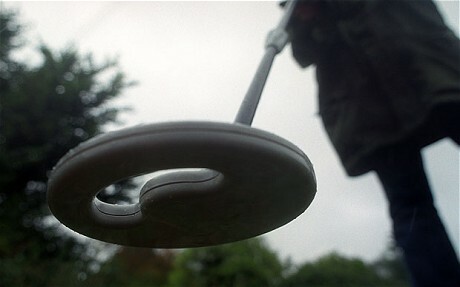 They indicate that they have in mind ground-penetrating metal seeking tools like the Minelab GPX 5000 (which "is claimed by both the manufacturers and the growing number of users to be capable of consistently detecting small targets at depths of 17 -22 inches, far below the level of most UK plough soil and hence into underlying undisturbed archaeology"). They argue that the increasing popularity of these models has major implications for policies concerning artefact hunting in the UK. For many years policy towards recreational and commercial metal detecting has rested upon the assertion that the activity was not particularly damaging if carried out within disturbed plough soil but clearly the use of machines capable of detecting much deeper invalidates such a claim (other than by assuming the users are prepared to exercise superhuman restraint upon the depth to which they dig in response to a signal). Despite claims the machines are too expensive and of limited use in the UK there is evidence that an increasing number are now being purchased, including for shared use by club members. In our view therefore it follows that urgent revisions are required to the Code of Practice for Responsible Metal Detecting in England and Wales, the Guidance for Organisers of Metal Detecting Rallies , DEFRA’s rules for detecting on Scheme land, the conditions laid out by all public landowners and statutory guardians and indeed all advice issued to detectorists and landowners by archaeologists. They point out that the growing popularity of these machines means the PAS may well find itself increasingly often in the invidious position of attending a commercial artefact hunting rally (bad enough) "and having to record numerous finds taken from below the plough soil right in front of them". HA suggest that this is something that ought to be condemned as irresponsible use of the finite and fragile resource that is the archaeological record. HA do not mention the other point, that artefact hunting is officially condoned these days on the grounds that it is (sic) "rescuing" objects that are under threat of being damaged by agricultural activity in the ploughsoil, the fact that growing numbers of artefact hunters given a change eschew this activity in favour of getting their hands on the "less damaged" artefacts from below the ploughsoil rather scuppers that argument. Perhaps the reasons why the UK archaeological world finds itself able to "partner" artefact hunters rather than discouraging them need to be re-examined. The arguments offered a decade or so ago may not be so applicable to the current situation or that in a decade's time - and yet the despoiling of the archaeological record to fill scattered and ephemeral personal artefact collections goes on, largely unmitigated, year after year. *[ The Association of Local Government Archaeological Officers, The Association of Regional and Islands Archaeologists, The Council for British Archaeology, The Institute of Field Archaeologists, The Institute of Historic Building Conservation, The National Trust, The National Trust for Scotland, Rescue: the British Archaeological Trust, The Society of Antiquaries of London, The Society of Museum Archaeologists, The Standing Conference of Archaeological Unit Managers.] Vignette: borrowed from Glasgow University.